My sister is my best friend. But it wasn’t always that way. Growing up, we had our share of fights, misunderstandings, and hurt feelings. In high school, we hated each other. It wasn’t until we were in college and beyond that we were able to forge our unbreakable bond of sisterly love. When I had my own kids, I was determined not to repeat the pattern of my youth. My two sons are five years apart. When my younger son was born, I told my older son that he was the luckiest kid in the world because he had a brother. 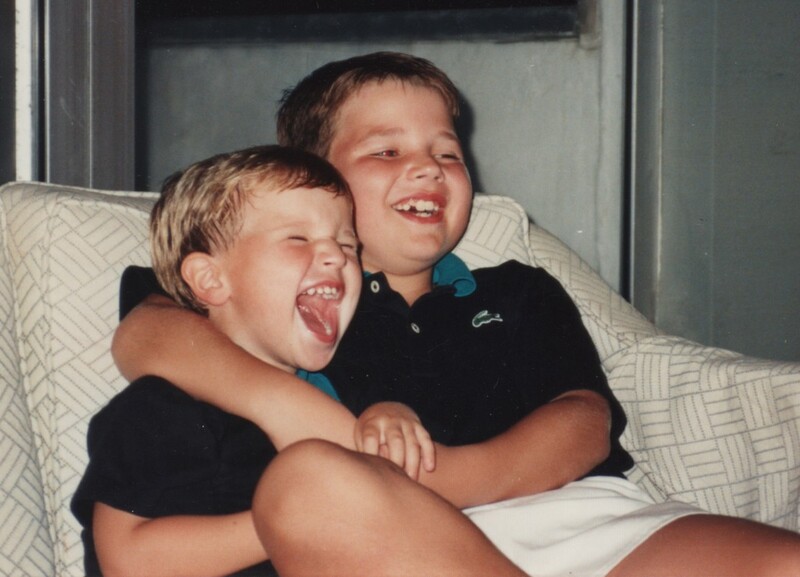 I explained that friends would come and go, but that his brother would be his best friend for life. Because his brother was going to have such an important role in his life, I told my son that he needed to protect that friendship and to never do anything that would hurt his brother. I repeated this same philosophy to my younger son when he was old enough to understand. To my delight, my sons internalized this idea. They never — I mean never — fought. They never hit each other. They always comforted each other and talked out disagreements. They teased, but in joyful ways, without chipping away at each other’s self-esteem. And boy, did they laugh! They started out best of friends, and now, decades later, are the same. Maybe we were just lucky. But maybe, instilling this idea of why it is important to be best friends with your sibling works. 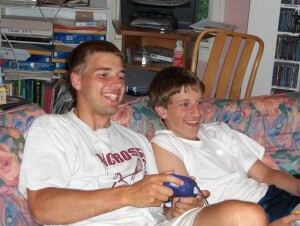 One of the other ways I encouraged good relations with my sons was through playing games. We played board games (from Winnie the Pooh to Connect 4 to Stratego to Monopoly and Risk, to name a few), card games, treasure hunts in the backyard, and video games. One of the great things about having a sibling is that you always have someone to play with. Games provide shared experiences, and let kids learn about winning and losing. We discovered that games were a great way to foster sibling bonds. This matching game (for ages 3-8) is unusual, because it can be played with up to four players. Presented on an inviting green nature background, brightly colored objects are sprinkled over the surface. 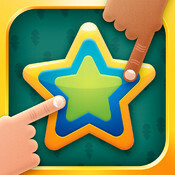 Grab your kid and fire up your iPad for a fast-paced game of matching shapes — one you can play together! 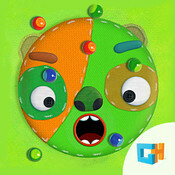 Offering three different games for up to 4 players, this app lets kids shoot and flick virtual marbles onto target boards, into outer space vortexes, or popped into a monster’s mouth. Known as a “huddle game” since the players all crowd around one device, <b>Marble Mixer</b> is a great game to play when your kids are getting antsy. With multiple modes, this puzzle game is all about placing hexagonal pieces on a board in such a manner as to make continuous colored lines. The more you play, the easier it is to see the lines forming; and the app offers periodic tips on how to play better. These puzzles require players to use math as well as logic. Best Game for a Room-Full of Multi-Generational People: Heads Up! A variation of Charades where the group acts out words, trying to help the designated player figure out what is on the screen of the smartphone or tablet that is being held up over his or her head. The secret sauce for this cooperative game is that the app covertly films the group who is acting out the words, and then lets the whole crowd review the silliness by watching the film. 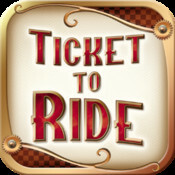 For other multiplayer app suggestions, check out our rec list called: Best Multiplayer Apps for Kids by clicking here. There are six additional apps on that list, and you can find purchase links to all of the apps discussed here from that list. Here’s to sibling bonding and family gaming via apps! Sibling rivalry has been around since the beginning of time, a normal and natural part of growing up and learning how to socialize and deal with other people. Just to clarify, playing video games is not a necessity in having a healthy bond with your sibling, or any other family member for that matter! I agree Busymom4, but sometimes playing games is a great way to create some healthy bonds. As the editor of Tech with Kids, Jinny brings 20 years of experience in reviewing children's technology. She is a nationally recognized expert (15-year Kid-Tech columnist for USA Today), and has tested thousands of products. She is the author of the book iPad Apps for Kids For Dummies.